Hirokazu Tanaka isn’t just any video game soundtrack composer. He’s a legend, having helped create the familiar 8-bit musical backdrops for games such as Metroid and Tetris among others. And the songs for Earthbound, a game which I played a lot as a kid, and which boasts a soundtrack that still goes strong today. Part of his skill lies in the simple fact he’s not drawing from a childhood spent sitting in front of an NES — he played the role of architect in shaping how a new generation of kids (and now, artists) hear chip music. He can’t fall for nostalgia, because he shaped nostalgia for many. 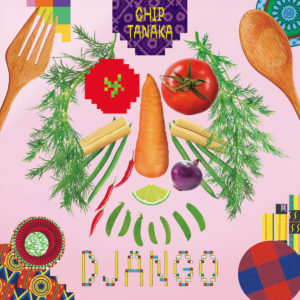 This is part of the reason that Django, the first full-length album under his Chip Tanaka moniker, sounds so good. The other is that Tanaka is just a great artist, whatever sound he leans in to. Django finds him applying 8-bit sounds — among others — to reggae, not novel on its own, but done well on cuts such as “Ringing Dub” and “Pop Bomb” by a dude who spent the 1980s playing in Kyoto-area reggae outfits (aside: peep that James Hadfield interview with Tanaka in the Japan Times today). Free to go in whatever direction he wants, Tanaka creates sunny-day hiccups (“Beaver”), ping-ponging cascades of bleeps (“Drifting”) and skittery pop (“Prizm”). It’s colorful and ever-surprising, rising well above the trappings some chiptune albums fall into when they get a little too fixated on childhood memories. No need for the guy who made a lot of them. Get it here, or listen below.